Originating from Portsmouth I acquired an arts degree at King's College, London together with a postgraduate teaching qualification. Then National Service caught up with me and I found myself at RAF Spitalgate which was then the RAF School of Education. After four weeks there I went on to RAF Jurby on the Isle of Man for Officer basic training. In due course I arrived at Ventnor in Dec 1955, as the first and only education officer to serve on the Island. I served for 3 happy years there, but went on to remain for 45 years in the RAF, serving tours in Aden (Arabia), Hong Kong (Far East) and Provence (France), before retiring as a Squadron Leader. My first CO was Eric Bell, with whom I (a newly qualified football referee) pushed the Station football team up from Div 3 to Div 1 in 2 years. My second CO was Andrew Deytrikh (a White Russian), who was a keen tennis player. We played as a pair and presented quite a respectable team. Andrew decided to commute from his house in Wokingham, so that he could enjoy continuation flying at White Waltham on Mondays and Fridays. He did not need his married quarter, and nor did anyone else, so I moved in, a newly married national service pilot officer into the CO's quarter! My job was fascinating. I taught the 3 compulsory national service subjects (English, Arithmetic and RAF History), also English, Maths and Science at higher levels. I supervised RAF training, conducted resettlement interviews, organised films and civilian lecturers, liaised with local schools and ran the Station library. As there were only 3 officers at the domestic site, I had all manner of secondary duties, including running all the Station sports activities, especially football, tennis, table tennis and a sports day, mess Secretary of the Officers' Mess, marching in and out of married quarters and hiring, courts martial as board member or defending officer, and so on. In later years, from about 1971, when I was posted to RAF Upwood to teach English to overseas students, I concentrated on English Language, and spent my last 18 years with the RAF at the RAF Staff College and finally the Joint Services Command and Staff College, as the English Language Consultant, writing all the English teaching material which I think the 3 Services still use to prepare staff officers. My daughter, Jennifer, our first baby, was born at Ventnor in 1956, and recently to celebrate her 60th birthday and reward her and her husband for all their help in our recent house move, we treated them to a Week-end in a Ventnor Hotel. That is how I discovered this website. David has very kindly contributed this more detailed account of his time at Ventnor.
" In 1956 with my training completed, I turned up at Ventnor Station by train, to be met by a Sergeant with a 1-ton truck, a moment never to be forgotten. In those days it was normal to travel around in uniform, and even policemen saluted me! Ventnor is situated on the side of a steep slope, with the railway station about half way up and the RAF Station at the top. There was an administrative site (about 400 yards long and 100 yards wide) at road level, and a technical site high up on the top of the hill. The latter had a very large modern steadily rotating radar and also the old wartime steel and wooden radar pylons, and an operations complex deep underground. The engineer, Flt Lt Eric Barnes, and all the Fighter Controllers (about 10?) worked up there. That left just the CO (Sqn Ldr Eric (Dinger) Bell), (later replaced by Sqn Ldr Andrew Deytrikh), the Adjutant (Fg Off Ken Brown and then Flt Lt Tiger Houghton) and the Education Officer (I was the first and last in the Station’s history) on the Admin site. The buildings were of prefabricated construction, the largest being the Airmen’s Mess and the Officers’ Mess. I was allocated a room in a prefab adjoining the Mess. I think that there were 2 rooms in each end, and my neighbour was Fg Off John Quarterman, then a Fighter Controller, who later transferred to the GD Branch to become a fighter pilot and, as a Wing Commander, to command a Squadron. (We met up again about 40 years later at Bracknell). Headquarters had one small prefab and the Education Section had another nextdoor. That was fortunate, for when the Adj went on leave, or when the CO went on leave and the Adj became CO, I became the Adj as well as my primary appointment. This gave me a marvellous grounding in RAF procedures, for I had responsibility for public and non-public funds, equipment, catering, RAF police, medical matters, all sports and so on. I was often the only officer on the domestic site, for the CO (Deytrikh, a White Russian) lived in Wokingham, where he had built his own house. He completed his continuation flying at White Waltham each Monday and Friday, travelled down Tuesday morning and back on Thursday afternoon, and, incidentally, played for the Station tennis team on Wednesday afternoons, and the second Adj (Tiger Houghton) lived in Lymington, where he spent long weekends, travelling in a Service Landrover. Some of the other Controllers I remember were Terry Holmes, Stan Hider, Dai Evans, Bill Jervis, Charlie Yates, Alan Nicholas and John Meader. The job came under the aegis of the General Education Scheme (GES), later to embrace training and be called FECTS (Further Education and Continuation Training Service). The job covered everything remotely connected with education, but not training, which was looked after by section commanders. Thus I had to deal with films, libraries, resettlement, careers, information room, external lecturers, part-time teachers, Officer’ Promotion Examinations, RAF and civilian GCE examinations, correspondence courses, external examinations, hobbies and handicrafts (such as woodwork and photography), art and craft exhibitions, and so on. As for teaching, there was a legal requirement to teach English, Arithmetic and RAF History to National Servicemen (Part I Education Test for promotion to Corporal). For promotion to Sergeant Part 2 Education Test was required. I believe the candidate had to pass English, Mathematics and one other of about 6 subjects. Each year I would gauge the requirement for teaching subjects, decide what I wanted to teach myself, and engage part-time teachers, whom I could pay to teach the other subjects. I had 2 National Service clerks, one of whom, Bob Dicker, I met again 40 years later when Effie and I played a golf tournament at Tylney Park and were drawn against Bob and his partner (from Hartney Wintney). A feature of those days was the periodic marking board for the Part 1 examination papers. Each Command convened a marking board to mark its papers. Our venue was Headquarters Fighter Command, Bentley Priory, near Stanmore. About a dozen of us were summoned, and we marked all day, lived in Service clubs in London and had a good time in the evenings in London. It was normal in times of Exercise for the Education Officer to take on a War Role as an Operations Officer. At Ventnor this entailed my going up to the Tech Site, where I was the only person at ground level apart from the Service policemen on the gate. My job was to watch for air attacks, judge how close the aircraft came to our radar masts and advise Group Headquarters what damage had theoretically been done and how long each radar would be U/S for. One night in the early hours the Air Officer Commanding and his retinue appeared unannounced at the gate. My orders were to admit no one without reference to the CO. I kept the AOC outside while I sent for the CO, even though I well recognised the AOC. Luckily the great man complimented me for my action. Of course, with only 12 officers Orderly Officer came round quite frequently. This I could do from the Quarter but not from an outside house. There were many checks to do, and at 2200 the OO had to go up to the Tech Site for a security check. There were not enough quarters for all the officers and airmen, so others took over civilian houses as ‘hirings’. When one of these changed hands there had to be a Marching In/Out Board, and I was a natural for that duty. I saw some pretty grotty houses on the Island, and lost count of the chipped cups and saucers I had to check. One other thing I remember about that period is the occasional Court Martial. It is customary for a young officer to sit in on several Courts Martial under instruction before sitting on a Court or acting as Defending Officer. Over the course of my career, I was Senior Member twice, Junior Member 3 or 4 times, and Defending Officer quite a few times. There was never the slightest chance of an acquittal; the best I could ever hope for was a strong mitigation case. I felt that I quite often minimized a punishment with a strong mitigation case, but there was just one time when I just could not find anything good to say about my client. I cannot write any more about Courts Martial, except for the foregoing generalities, because I have sworn not to ‘unless required to in due course of law’. However, from Ventnor I had to go to RAF Sopley, our parent station, for one Court Martial. This required a ride by Service car to Yarmouth, a ferry across to Lymington, and another Service car the other side. I travelled back to Portsmouth each weekend for some months, and then we decided that it would be sensible to get married and live together. We were married at St Wilfrids, had a reception meal somewhere near the Guildhall and had a honeymoon on the Isle of Wight. The first night we spent at the Undercliff at Ventnor, so that we could celebrate with our Service friends, and then went to Yarmouth for the rest of the time. We took a grotty flat in Portsmouth at first, but moved as soon as possible to a nice little flat in Ryde. I went to work each day by train. Naturally it made sense to look for somewhere more convenient, but we could not afford much rent on National Service pay. Then we had a stroke of luck. A hotelier from Sandown had an idyllic house, called Dawn Rise, which he wished to use only for the busiest hotel fortnight of the year. We were able to rent it for the rest of the year. He was looking for £7 per week, but when we explained that our maximum was £3 per week, he cheerfully accepted. This house was situated high up above the sea on the Shanklin road, a 2-mile bike ride to work, and was absolutely beautiful. It had a rockery front garden with about 40 steps from the road up to the front door. Our daughter Jennifer was born in December, at home, hence her second name Jennifer Dawn. I was present at the birth and all went well. In winter my bike ride was not too funny, and we decided that we would have to buy a car. Considering our assets, we found that we owned a total of £55 in the world. A friend at Aldershot, was able to identify servicemen going abroad and selling cars, and he found a Morris 8 for me, for £52.10s. At that time the Suez oil crisis was with us and a learner driver could just put up L Plates and drive. I got Eric to bring the car down to Yarmouth. I do not know how he managed, for the car had no brakes whatever. When I came to a T junction I intended to pull up, but the car gently ploughed into the opposite bank. We somehow made it to Ventnor and had the brakes attended to. I taught myself to drive, up and down Ventnor’s steep roads, and passed my test in Newport. In JUly (1957) I nearly killed myself in that car. The old wooden pylons were being pulled down and we were invited to help ourselves to the tar-impregnated wood. I filled the Morris with as much wood as it would hold and set off down the steep hair pin bends. Just as I reached the Married Quarters, the brakes gave out and the car leapt forward. Ahead was a cemetery wall, but I was not ready for that, so I pulled left into a wire fence. That stopped the car with very little damage, but all the wood crashed through the windscreen or hit me on the back of the head and I had glass splinters in my hands. By then we were living in a Married Quarter. 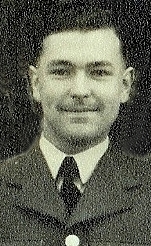 As a National Serviceman, and under 25, I was not entitled to a Married Quarter, but the new CO did not intend to bring his family down, and nobody else wanted a Quarter, so I moved in – “CO’s Residence, Pilot Officer Passby speaking!”. That reminds me of reserving tennis courts in Ventnor; when I rang up, I heard a voice say “This is the tennis courts speaking!”. While still at Ventnor, I was promoted Flying Officer. Eric Bell was a soccer buff, and was connected, I think, with Hillingdon FC, then in the Southern League. He tried to enter a Station team in Division 1 of the Isle of Wight league, but was told that he would have to start in Division 3. That was the point when I arrived. So I had a game every Saturday that season, which we usually won about 15-0. Next year in Division 2 we won most matches about 5-2 and got promoted to Division 1. By that time, Eric had retired, the Station was closing down, and I was left holding the baby, playing in Division 1 and often unable to produce eleven players. I had qualified as a football referee while at Training College, so I registered on the Island, and spent most Saturday afternoons refereeing village teams in the Island league. I had some pleasant evenings playing table tennis in village halls with 2 airmen, and in the summer I ran the Station tennis team. We played Island clubs and sometimes went to the mainland to play other stations. I played in the Isle of Wight tennis tournament and got to the final of the plate, where I had to play my University partner, Maurice Johns (then doing his National Service in the Royal Navy at Portsmouth). Unfortunately, I hit my knee with my racket. My knee swelled up like a football, bursitis was diagnosed, and I could play no longer. It never happened again. I organized a sports day on the Station, doing everything myself, including constructing high jump posts that were so unstable that the rope dangled nearly to the ground and enabled the winner to break the world record.